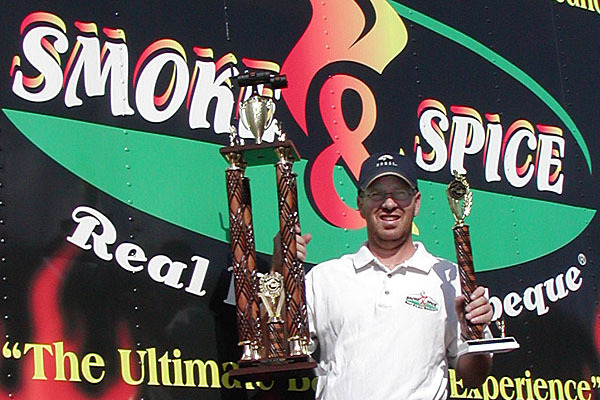 Mark Rogers of Smoke & Spice has been competing in and wining on the competition BBQ circuit since 2003 when he and a couple of friends entered their first contest in Arcadia Florida, sanctioned by The Florida BBQ Association. At that first contest in Arcadia they won 4th place in brisket and received trophy and a check. At that point Mark was hooked on competition barbeque and realized he found his passion. he continues to compete each year in contest and has made many new friends along the way. Click Here to see a gallery of Smoke & Spice Contest Photos. Some people work to live. Others live to work. But when cooking is your passion, it doesn’t get much better than spending your time cooking up something memorable. Mark Rogers, founder of Smoke & Spice Fine Catering & Events, loves his work, and in order to test his skills against the rest, he participates in professionally sanctioned contests as often as he can. Mark and his wife Ingrid have traveled throughout the region and beyond, from Miami to Kansas City, in order to compete in sanctioned regional and national contests. The Smoke & Spice team has won more than 70 sanctioned barbeque awards and tens of thousands of dollars in prize money. What does that mean? Even experts agree – when it comes to fine catering and cuisine in South Florida, Smoke & Spice Catering simply has no rival.